The work of Leon Frousset, will be raffled at the Acme saloon; 60 chances, one dollar each. Let everybody see it." brought him back again and for the second time he reproduced the beautiful view. on a general view of this place which will also be raffled." "Painting of Las Cruces in the early days. Hanging on the north wall of the Palmilla club on main street, is an oil painting of old Las Cruces in the days of cattle wars and gun men"
"A transient French painter, Léon Trousset by name, in his pilgrimage across the Mexican Republic , visited our beloved Celaya en 1882, leaving in his trail, as was his custom, a painting that illustrated our city in as it was then." Thanks to the El Camino Real Chapter of Questers, the first of the Mission San Luis Rey's two large, 7-by-10-foot oil paintings hanging in the historic chapel will be removed at 1 p.m. today for restoration. I told you some time ago about the El Camino Questers' mammoth project to restore the two priceless Mission oil paintings, and today the process begins. The Questers, a local historical preservation chapter, has received a number of donations from the public, as well as raised money through a variety of fund-raisers, plus received a $5,000 grant from the California State Questers, its maximum amount for a preservation and restoration project. Removing the first painting for restoration is the Balboa Art Conservation Center of San Diego, which will be doing the work. In 2001, the El Camino Real Questers authorized and paid for a proposal from Balboa Art to restore the pair of paintings, "The Assumption of the Blessed Virgin Mary," and "The Resurrection of Christ," by French artist Louis Trousset, (circa. 1878), which hang in the Mission Chapel. Without treatment, the paintings would eventually be destroyed by their many years of exposure to light and air pollution. Cost estimate ranges from $17,000 to $19,000 for each work of art. "Once 'The Assumption' painting has been restored and rehung, Balboa will begin work on 'The Resurrection,'" says Virginia Brophy, president of the El Camino Real Questers. The paintings have become quite a tourist attraction as more than 40,000 visitors from around the world stop by the historic Mission chapel each year. 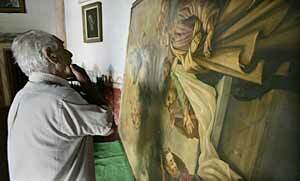 Paintings' discovery serendipitous - Trousset Paintings at San Luis Rey Mission to be restored. Scores of antique lovers and history buffs from across North County descended on Mission San Luis Rey on Sunday in a benefit aimed at raising more than $10,000 to restore a historic painting. Some of the mystery surrounding a 129-year-old oil painting at Mission San Luis Rey was cleared up yesterday when it was removed from a wall in the church for a six-month restoration. But the new curator of the mission museum still has questions about the artist, Leon Trousset, and even the painting's correct name. A historic painting is back home at Mission San Luis Rey after a six-month, $20,000 face-lift, the colors restored to the vibrancy with which the artist applied them nearly 130 years ago. "Overwhelming," is how Bradford Claybourn, curator of the mission museum, described the work performed by conservators at the Balboa Art Conservation Center in San Diego's Balboa Park. Some months ago this column shook loose some local history, bringing together the descendents of 19th century artist Leon Trousset and the El Camino Real chapter of the California Questers, who raised more than $14,000 for the restoration of one of his Mission San Luis Rey oil paintings. El Paso Museum of Art interim head of education Ben Fyffe and Tracy Trousset talked Tuesday about the painting by 19th-century artist Leon Trousset. A visitor from California came to see one of the most popular paintings at the El Paso Museum of Art on Tuesday and to ponder the mysteries surrounding its creator. The painting is "View of El Paso, Texas, 1885," by Leon Trousset, a Frenchman, a prolific painter and an avid traveler who left a trail of oil paintings and sketches of early border life throughout the Southwest and northern Mexico. The visitor was Tracy Trousset, who married Trousset's great-grandson and became fascinated with the Trousset -- pronounced "troo-say" -- history, or lack of it. The painting shows a view of El Paso from what is now Downtown Juárez and what was then an idyllic rural setting traveled by a wandering donkey. On the other side of the river, El Paso was a growing urban sprawl sliced through by a brand-new locomotive -- the railroad arrived in El Paso in 1881. Tracy Trousset, who commissioned a reproduction of the painting for her Hemet, Calif., home years ago, set eyes on the original for the first time Tuesday. "This is my favorite. The beauty and the details," she said. For El Paso, the oeuvre is a historical document. It sheds light on the crucial period when El Paso transformed from a sleepy town to one connected by rail to the national economy. "It's one of three paintings of El Paso in the 19th century at the museum. We use it a lot on school tours to talk about how the city has developed," said Ben Fyffe, the interim head of education at the museum. The painting was on the cover of the 2001 Southwestern Bell El Paso telephone directory. Other Trousset works adorn the jacket covers of historical books, and one scene, a view of old Mesilla, is in the Smithsonian collection in Washington, D.C. "View of El Paso" is a gift to the museum from retired El Paso lawyer J. Sam Moore Jr. who bought it at auction from Sotheby's in 1997, narrowly winning the bid over an Austin collector. For the past eight or nine years, Moore, Tracy Trousset and others have been corresponding and discussing the life of a man who left no journal, just three cryptic poems. When and where was he born? How did he get to the United States? What motivated him to paint the unglamorous border? "We'd love to know," said R.B. Brown, an adjunct professor of anthropology at UTEP. Just as Trousset paintings keep popping up -- Brown found one in Mazatlan during his Christmas vacations there -- Brown believes new information will surface. The first trace of Trousset was a sketch of Fort Inge, Texas, in 1867. And the last was his death certificate that Brown found in Juárez a few months ago. It was dated 1917. He was in his 30s when he painted "View of El Paso." Tracy Trousset has scrutinized the Trousset paintings and poems for clues. "He was a very religious man. Almost every painting has a mission on it. He also did some work commissioned by churches in California. The poems seem very religious as well," she said. The poems also show a longing for his native land, including this line, "alone, lost without a homeland." Such lines make Tracy Trousset suspect that her family's ancestor had been somehow forced into exile. Officials at the El Paso Museum of Art pointed out that the strong composition in "View of El Paso" hints at some formal artistic training in France. Brown said Trousset used to raffle off his paintings in saloons, such as the Acme Saloon in El Paso, selling $1 tickets, then often buying the paintings back from the winner, to sell them again later. They would fetch $40 to $60 at a time, Brown said. "View of El Paso" was valued at $34,500 when it was sold eight years ago. After the El Paso viewing, Tracy Trousset, Moore and Brown headed to the Centro Municipal de Artes in Juárez to see a portrait of Padre Hidalgo by Trousset, to the museum of the Ex-Aduana for an exhibit of Trousset works, and to meet with Jorge Alvarez, the Juárez city manager and a Trousset collector. Tracy Trousset, right, a relative of 19th century artist Leon Trousset, and Jennifer Nielsen, director of the El Paso Museum of History, listened to Sam Moore, Jr. an El Paso Museum of Art Foundation Board member talk about the painting in the background. The oil on canvas painting, entitled "A View of El Paso," was made in 1885. Tracy Trousset was in town to view Leon Trousset's paintings. Photo by Victor Calzada / El Paso Times. in the news article about the celebration. El Camino Real Questors view painting they helped restore. 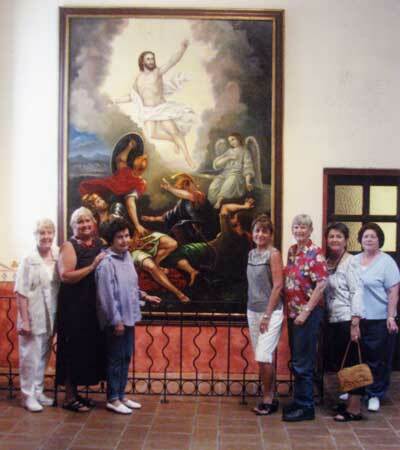 The members of the El Camino Real chapter of Questers recently were invited to view the 'Resurrection of Christ,' painting by Leon Trousset hanging in the Mission San Luis Rey Museum for the first time since the preservation and restoration of the painting was completed. The El Camino Real chapter funded the conservation supported by a grant from the California State Questers and the International Questers organizations. From left are Rita Shepard, Linda Snyder, Elsie Whitnack, Tracy Trousset, Carol Moon, Jackie Traughber and LaVerne Laws.